PT Telkom Akses - PTTA or referred to as "Telkom Akses" is a rapid growing company in Indonesia that focuses on serving information technology (IT) industry. Based in Jakarta, Telkom Akses has its business activities focused in3 business pillars; construction, managed services and trading in the field of telecommunication. The Company also engaged in providing construction and fixed-broadband network infrastructure construction services. Its business include broadband network installation, network terminal equipment (NTE), and operation & maintenance (O&M). 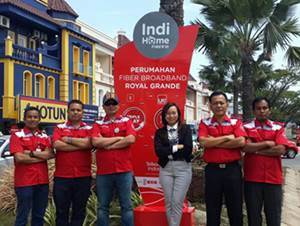 PT Telkom Akses is a member of state-owned telecommunication giant PT Telekomunikasi Indonesia Tbk (Telkom Group). PT Telkom Akses was founded on 26 November 2012 and commercially operate on February 2013. Telkom Akses now has 5 regional areas spread across Indonesia; regional area Sumatera, regional area Jakarta - Banten, regional area West Java - Central Java, regional area East Java - Bali - Mataram - Kupang and regional area Kalimantan - Sulawei - Maluku - Papua. Its head office is registered at Jl Letjen S Parman Kav 8, Grogol, Petamburan, Jakarta 11440. In term of financial performance, PT Telkom Akses succeeded in achieving acceptable and sound growth in 2015. According to PT Telekomunikasi Indonesia Tbk Annual Report 2015 as cited by JobsCDC.com, Telkom Akses registered total assets of Rp5,098 billion in 2016. This total assets figures equivalent with a 37.93% growth from Rp3,696 billion in 2015. Minimum Bachelor or Master Degree in Business Studies, Administration, Management, Economics, Finance, Accounting, Banking or equivalent. Minimum 5 years of experience in the related field, preferably Manager/Assistant Manager specialized in Finance - General/Cost Accounting or equivalent. Have a good skills in commercial and business awareness. Have a good analytical approach to work. Good problem-solving skill and initiative. Good time management skill and able to prioritize. Able to work in a team and to build strong working relationships. Have a good capacity to make quick but rational decisions. Potential to lead and motivate others. Minimum Bachelor or Master Degree in Computer Science, Information Technology or equivalent. Minimum 1 year of experience in the related field, preferably staff specialized in IT/Computer - Network/System/Database Admin or equivalent. Proficient in mobile apps developer (android and IOS), Ionic Framework developer is preferred. Strong understanding in SQL Command. Strong knowledge of XML/JSON/REST/Web Service Interaction. Operating knowledge of MySQL database. Technical experience in SQLite, http request and GPS Navigation (Google API and NFC would be an added value). Understand and follow latest mobile app technology. Familiar with Object Oriented Programming. JobsCDC.com now available on android device. Download now on Google Play here. Please be aware of recruitment fraud. The entire stage of this selection process is free of charge. PT Telkom Akses - IT Mobile Developer, Financial Manager Telkom Group August 2017 will never ask for fees or upfront payments for any purposes during the recruitment process such as transportation and accommodation.